This is the second in a series of 3 articles about High Speed rail in the UK. The publication of the government´s policy document in January 2012 entitled "Review of the Government´s Strategy for a National High Speed Rail Network" laid out ideas for fast rail transport. On 28th January 2013 under the title "HS2 phase two initial preferred route plan and profile maps"the specific ideas for the extension of HS2 from Birmingham to Manchester and Leeds were published. This document looks at both phase one and phase two. Also published by the DfT on that date was the accompanying document to justify the choices made titled "High Speed Rail: Investing in Britain’s Future –Phase Two: The route to Leeds, Manchester and beyond"
This blogger works under some assumptions which have to be repeated. (e)- Any new transport construction should be developed so as to make the most efficient use of energy, and reduce the toxic and noise pollution from the most offending vehicles,thus leading to their reduction in use and the liberation of space on public ways. (f)-The existing rail corridors should be recognised as such, and therefore, accepted as being the main arteries of the country. They should all consist of four tracks of rail (next to or near each other) so that there can be a separation of fast rail from regional, local and freight services but interconnecting in case of need (for emergencies or maintenance). (vi)- projects which become self serving to the interests of political, financial, technical and legal groups to the detriment of the public good. (vii)- nimbyism for nimbyism´s sake. In the previous blog I looked at the two main north-south trunk rail lines connecting London with the north west and Glasgow via the WCML on one side, while the ECML connects London with Leeds, York, the North East and Edinburgh on the other side of the Pennines. With the High Speed line (HS2) from London to Birmingham approved and progressing (at least in the planners´offices), I think it is time to look again at the problems and try to sort out solutions for this small island of ours. HS2 has as its basic idea to link London with Birmingham with the eventual proposal to link Birmingham with Manchester and Leeds in two separate branches. This article tries to look at the proposals in a critical way. It is recognised that there is a shortage of line capacity on the West Coast main Line (WCML) which will become acute in the next ten years. This is, mostly, on the section from Rugby to London.The problem is particularly bad with local stopping services and regional services. Commuters suffer from overcrowded trains, especially in the rush hours and there are no paths for more trains. The intercity trains also have no more paths available. For that reason trains are being extended from 9 to 11 carriages. Some stations, think of the Trent Valley stops, are not served as well as they should be. They, thus, reduce the number of passengers and the possible revenue for the rail companies while increase the road traffic to satisfy the demand. This is the principal reason for the desire to build HS2 from London to Birmingham. The time lag mentioned in the documents published in January 2012 suggests the new HS2 to the West Midlands will be operational in 2022 while the extensions to Manchester and Leeds will take another eleven years, up to 2033!!! That is 20 years from now to see and be able to use a mode of transport which only partially solves the problem. A good straightforward explanation of the steps needed in getting HS2 started is given in an article in "The Rail Engineer" (11 February 2013) titled "High Speed Interest"
This blogger thought it best to split HS2 into three parts and so deal with each separately. -The white line indicates the route decided for the rail line from London to Birmingham and the proposals of HS2 Ltd.to the government from Birmingham to Manchester and Leeds. -The black line indicates the present classic line in the respective corridors. -The green line indicates the classic line widened and upgraded to four tracks. -The purple line indicates a new two track fast section of line to complement the classic line. -The dark blue sections are parts of the new two track fast section in a tunnel. -The lighter blue sections are those which combine short new sections combined with upgraded classic sections of line. The newly established (white) route leaves Euston in a new tunnel to Old Oak Common then continues along the present Chiltern Line /LUL corridor from North Acton to West Ruislip (almost at the M25). From there it steers northwest, south of Amersham, south of Aylesbury, north of Leamington Spa while south of Coventry to an out-of-town stop near the National Exhibition Centre at Birmingham. One section then branches off to enter into Birmingham City Centre via Water Orton to a new city centre station at Curzon Street between New Street and Moor Street stations. The other sector branches off northwards to join the WCML between Lichfield and Rugeley. The route that this blogger proposes runs from Paddington through Old Oak Common, along the present Chiltern line (upgraded to four track) to east of Beaconsfield, then along a new two track fast stretch, including a tunnel under Hazelmere(10.6 kms.) to finally rejoin the Chiltern line west of Princes Risborough. The route then continues along the Chiltern line (upgraded to four track) to Aynho (just south of King´s Sutton). from there the route is new up to the WCML just east of Birmingham International Airport. from there the trains can run on the present (upgraded) WCML into Birmingham New Street or northwards to join the WCML just west of Lichfield Trent Valley station. According to my calculations the HS2 route from Old Oak Common to Birmingham Curzon Street is 166.6 kms. while using a combination of Chiltern line (Classic route- CR) together with new sections the route would work out from Old Oak Common to Birmingham New Street to be 166.0kms. The saving in distance would be 600 meters, not a lot over such a distance but something. The real savings would be others. The HS2 line is all new, will be hidden as much as possible in tunnels and cuttings but is tremendously obtrusive in (as yet) unspoilt areas. This blogger´s proposal is less obtrusive since it uses an already existing corridor for more than half its length. For the other sections it can still use tunnels and cuttings to reduce its environmental impact. The HS2 proposal in effect demands the construction of half a new station at Euston, a new station at Birmingham Curzon Street and a completely new station, out in the boondocks on the wrong side of the National Exhibition Centre outside Birmingham requiring a twenty minute walk to the airport. This means a Birmingham Parkway station where people can access it by car thus providing the excuse to use a car and not public transport. This negates the purpose of public transport. Public transport, as usual, will be poor and far between, basically serving the poor, infirm, aged and students - only operating during the busy times of day. Who would want to be stuck out at such a station waiting for a bus at 10.30 pm.? The Euston station station means an unnecessary tunnel to it from Old Oak Common coupled with lots of housing to be demolished, just so developers can erect office blocks over the station - something they forgot to do with the rebuilt Euston of the 1960s. With Crossrail subtracting services from the station Paddington can provide platform capacity for HS2. The station problems in Birmingham are unique. New Street, Moor Street and Snow Hill are all important termini (or city centre stations). the possibilities of rebuilding and extensions are limited so a new station at Curzon Street might well be necessary. It all depends if Curzon Street is to be a terminus station or if the HS trains will continue through Birmingham City centre to population centres beyond (this is what the French do). However, what must be ensured are the connections between them - albeit through underground walkways, but protected from the weather in any case. The connection from Birmingham northwards to Manchester and Wigan is clearly more problematic. It is just as well that it it is only a recommendation and not definitive as yet since it is totally unjustifiable. From Lichfield the HS2 has a connection to the WCML from where it also continues on a roughly parallel route north of the WCML to Crewe for a distance of 61 kms. (a) Colwich to Stafford East of 6.86kms. (b) the Stafford underpass (for through trains to avoid the curves) of 4kms. (c) a short stretch of line to be straightened at Norton´s Bridge 3.6kms. (d) a short stretch of line to be straightened at Baldwin´s Gate 4.35 kms. all these to be two tracks supplementing the present four track system. The difference between the two proposals makes for 42.19 kms of construction which are not necessary. On page 41 of the command document for phase 2 is shown the proposed underpass for Crewe. This is necessary for all trains north-south as well as south-Manchester ones which do not stop at Crewe. HS2 Ltd´s proposal means the line to Manchester runs there on new track after leaving the town to the north. I disagree with that proposal. I suggest the line branches off to Manchester in the underpass emerging outside the town to join the present Sandbach - Holmes Chapel WCML line outside Crewe after passing under the town and branching off northeastwards under the town. The main WCML can continue northwards and emerge outside the town on the outskirts at Leighton. It then continues northwards on the present WCML. From Warrington to Wigan there is just one section which needs to be fourtracked of 4.56kms. Then the whole line from Crewe to Wigan would be fourtracked but with no great major works north of Crewe.. This total of updated lines comes to 26.81kms. From Wigan the line runs up to Preston but would need to be fourtracked from Wigan to south of Euxton for 12.4 kms. This is about half the distance to Preston but would mean the line is fourtracked all the way to that station. What is problematic is the curvature of the WCML through Wigan North Western station (this is not a problem at Warrington Bank Quay) together with the length of the platforms for long HSR trains. These two points have not been mentioned at all in the command document produced by the DfT. The line from Crewe to Bamfurlong : HS2 Ltd. is proposing a completely new line to branch off the present WCML north of Crewe to travel in the direction of Altrincham. One section would then turn left to pass east of Warrington to rejoin the WCML just south of Wigan at Bamfurlong (north of Golbourne). This section is unnecessary carving up of the countryside and marginalising Warrington which is an important provider of passengers for long distance services on the WCML (more than Wigan). The HS2 proposal is 49.2kms. while the WCML alternative is 50 kms. The latter route, however, is cheaper and much less disruptive. From Crewe to Manchester the HS route goes along the same line to Altrincham where it turns right just below the M56 motorway towards Manchester airport. The M56 then turns north east and here where the HS2 crosses the motorway, between Warburton Green and Davenport Green, an interchange station is planned. This would be on the left side of the motorway some distance from the airport terminals and in my opinion is a very bad option. If the WCML is taken from Crewe through Sandbach, Holmes Chapel and Wilmslow the line can branch off left along the existing tracks into the airport to stop at the existing terminal station. Better it would make it for the line to continue west out of the airport to then turn northwards to follow the proposed line through Didsbury to Piccadilly. This extension through the airport does not have to be particularly disruptive as it could be laid between the motorway link road and terminal 2 - even better would be for the rail to go underground just at this point before turning right towards Manchester. To make the whole line from Crewe to the airport four track would require upgrades of two sections: one from Sandbach through Holmes Chapel of 13.7 kms. while the other section is from Chelford through Wilmslow into the airport of 14.0 kms. The HS2 line from the airport into Manchester from this point goes undergound to emerge just north of Longsite before entering Piccadilly. I agree with this route. This line only needs to be two track. It should be remembered that the lines entering Manchester are multiple from Crewe and Stafford so give various options in case of need - accident or maintenance. In that case just one line need be four track while the others can remain two track. HS2 Ltd´s proposal for the route into Piccadilly from Crewe means 50.7 kms. of new construction added to the extension of 26.54 kms. to Wigan . My proposal to build a new line from the airport into Piccadilly means just 16.2 kms. of new construction. This is a significant saving to achieve better results. 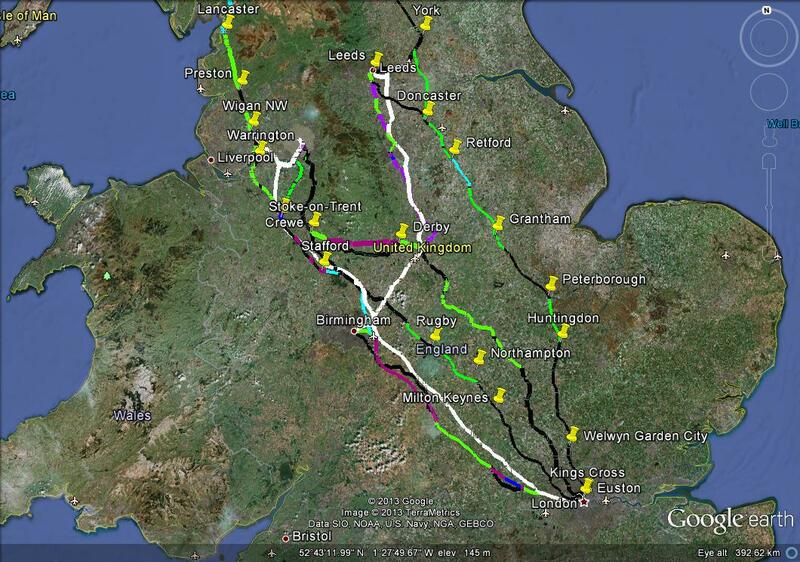 The total of new HS2 construction on the two branches from Crewe to Manchester Piccadilly and Wigan come to 77.24kms. On the other hand the improvement of the WCML through Warrington to Wigan plus the lines from Crewe to Manchester Piccadilly mean just 16.2 kms. of new construction plus 54.51kms. of upgraded lines. The added advantage of the second option is that the fast line actually goes through Manchester airport (and not stop at some considerable distance from it), the potential traffic to/from Warrington is included, and also of paramount importance, unnecessary scarring of the landscape is avoided. It should not be forgotten also that Warrington Bank Quay is the transit point for Chester and North Wales for passengers from the north. The HS2 line leaves Birmingham just north of the Water Orton line into the city centre to branch off northeastwards parallel to the M42 and A42. Having passed Ashby-de-la-Zouch it then passes under East Midlands airport to end up at Toton (to the west of Nottingham). This new section from Birmingham city centre to Toton comes to 70 kms. While this blogger agrees with the route in general terms I would like to point out some details. I see no need for the line to pass under East Midlands airport at all. It is unnecessary expense. It could curve round south of Kegworth (instead of north) to join the Midland main Line (MML) just south of the East Midlands airport station. In that case if the HS2 line stops at Birmingham airport instead of another station on the other side of the National Exhibition Centre, it would then stop at East Midlands airport station thus connecting the two airports. Connectivity is what we strive for, do we not? I consider a stop at the East Midlands airport necessary for services to Derby and onwards, as will be shown later, but also for services on other classic lines to other population centres north of Nottingham. One point to bear in mind is the desire, or not, to leave the door open for fast regional services (such as SOUTHEASTERN ´s from North Kent into St.Pancras on HS1)as well as HSR intercity services. This would be done if the demand were not so great for the intercity services while there could be a strong demand from intermediate population centres. Then a stop could be built at Ashby-de-la-Zouch. My last point here is to criticise the choice of Toton as a stop, which only promotes car usuage. but I will develop that in a moment. 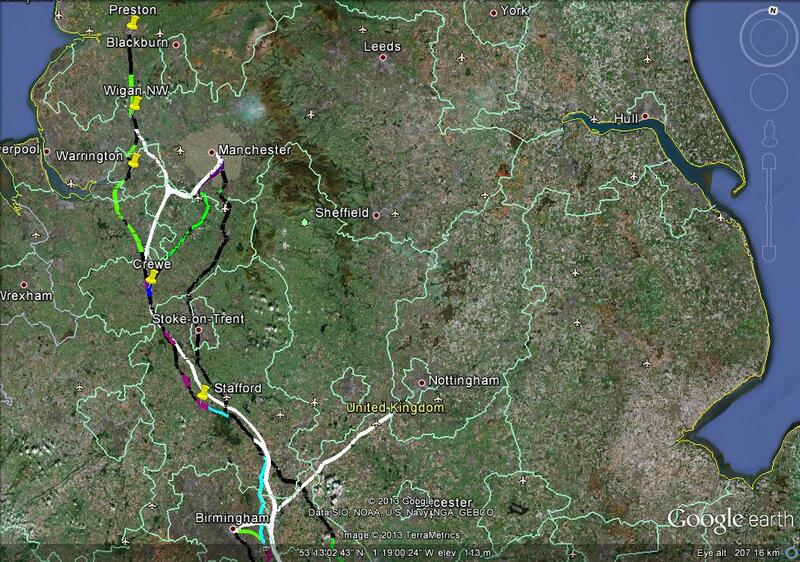 On the map I have published (courtesy of Google Earth), you will notice that I have included a line to Stoke-on-Trent. A link from the MML (newly electrified) to Derby is a must, without question. The point is this. If you improve the line from Derby to Stoke then you can offer another entrance into Manchester. The present service is slow and not competitive. However, with improved times you can offer alternative services, serving important population centres (including between themselves), and direct into St. Pancras for HS1 services to Paris and Brussels. East Midlands Trains would thus be in a position to offer realistic competition to Virgin Trains (assuming the same operators are the franchisees in the future). As can be seen on the map two short upgraded sections (meaning to four track) would be needed from East Midlands airport to Derby (15.8 kms.) and from Blythe Bridge into Stoke (11 kms.). The section between is too curvy to be used as a fast line so a two track fast line of new construction would be built of 41 kms.. Such a new line would improve connecting times from Stoke (and thus from Manchester) to East Midlands (and thus St.Pancras). The building of this can be much quicker than HS2 thus dampening down demand on the WCML and offering alternative capacity in a much shorter time span. The savings on the envisaged investment (as mentioned before) for the destructive swathe through Cheshire could be devoted to this project. The line from East Midlands to Leeds is perhaps the most important and most needed of all those proposed in this group. However, from where it leaves and which cities it touches determine its route which is not necessarily the best available. The idea is for the HS line to follow the line of the M1 motorway to Duckmanton (to the east of Chesterfield) from where it would continue north to go midway through Sheffield and Rotherham rejoining the line of the M1 just south of Meadowhall. 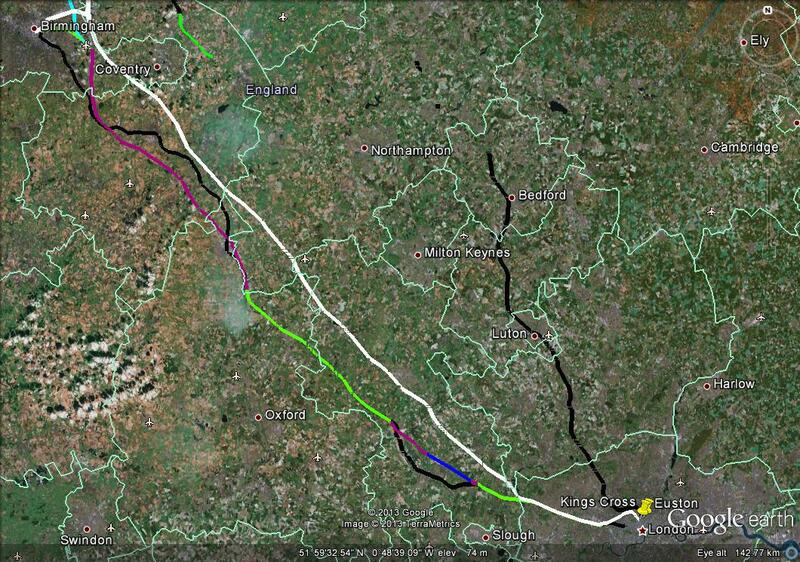 From there it would branch off the M1 to go past Cudworth, Royston, Normanton and Mickeltown. From there it turns left along the river then south of Hunslet into the centre of Leeds. The York branch would continue north from Mickeltown to follow the line of the M1 to the north of Garforth and Mickelfield, and from there to join the Leeds-York mainline north of Church Fenton. This involves totally new construction of almost 135 kms. South and West Yorkshire has a plethora of rail lines constructed in the 19th century which do not all serve the needs of the 21st century. The best route to Leeds is through Wakefield from Doncaster and the ECML. This route will continue to compete with the HS2 route through Sheffield. It does not subtract, however, for the need to mark a fast line through south and west Yorkshire to Leeds. The basic errors of the proposed line is to have the East Midlands station at Toton, outside Nottingham, the South Yorkshire station at Meadowhall (which is nearer Rotherham than Sheffield) ending in a terminus at Leeds New lane, while the main line continues north ignoring Leeds to join the ECML on the way to York. Of course, one decision leads to another which eventually determines the whole route´s trajectory. Thus one error leads to another. It is necessary, therefore, to look at the basic premises. A completely new line, completely separate from any other is a basic error. It is extended throughout the whole HS2 project but is totally unnecessary. Obviously if that is the premise then the alignment draws itself. HSR trains can, do and should run on classic lines as well. Out-of-town stations are not acceptable.These Parkway stations are based on the idea of driving to the station and parking there. This error should have been recognised by now. It promotes the use of the car (a heavily polluting vehicle) just for the benefit of those who own a car or who have access to one for journeys. It ignores the sector of the population which does not benefit from the use of the car. Public road transport is ignored. Access to the fast rail lines should be in city centres - this is where public transport goes. Point to point travellers want to go to city centres for business, pleasure or onward travel. We want to ensure that city centres remain living and vibrant thus helping their continual renovation. Parkways do not do this. Thus the premise is so very wrong. What is to be done? If we start the HS2 line from East Midlands airport then it should be taken through Nottingham. Firstly along the upgraded classic line then from Attenborough station the line would curve first south then northwestwards under the city centre with the station underneath the present city centre station. From there this new line would go northwest to emerge overground between Nuthall and Bulwell. Then on it would run next to the M1 motorway to just south of Bolsover where it leads to Sheffield entering a tunnel on the outskirts of the city emerging again near Kenninghall Road to connect to the classic line into the Sheffield city centre station. the line then runs on the classic line through Meadowhall and then left alongside the M1 to emerge north of Chapeltown before the end of the tunnel and then continue to the west of the M1 along a new line to Barugh Green where it rejoins the classic line. From there the upgraded line continues north to Horbury where a new section is constructed past Tingley to rejoin the classic line east of Morley. Then the upgraded line leads us into Leeds(main station). HS2 Ltd. envisages a branch off the line to Leeds to go to Church Fenton to service intercity trains to York and the North East. What is conveniently forgotten and not mentioned in the 108 page command document is that the electrification of the Liverpool (via Chat Moss) line to Manchester Victoria is to be extended to Leeds and on to York. This will enable the Transpennine trains to travel under wires from Liverpool to Newcastle. Why is most of this investment from Leeds to York going to be ignored and wasted? The conclusion reached is that, of course, a new branch line has to be built because the decision to run Leeds trains into a new station has already been made. This is scandalous. Unnecessary contruction (19.7 kms.) thus unnecessary expense. What is wrong with running any Teeside or Tyneside trains through Leeds main station? The question of a new station in Leeds is the moot point. A new service/maintenance depot will be needed without doubt. That does not mean a new station by any means. There are accessible yards available for conversion at Hunslet, or land for a new depot at Kirstall, or even other places. Destruction of existing buildings at New Lane is unnecessary and expensive in the city centre. In the previous blog (the first in this series) I mentioned the ECML and WCML and how they could be upgraded to achieve significant savings in time for services to the North East and Edinburgh, on one side and to the North West and Glasgow on the other. The picture below illustrates how HS2 fits in with these two routes plus the Chiltern Line and MML. It can, thus, be seen that the four routes should really be taken together and how each can aid the others. This way capacity problems can be achieved all together. 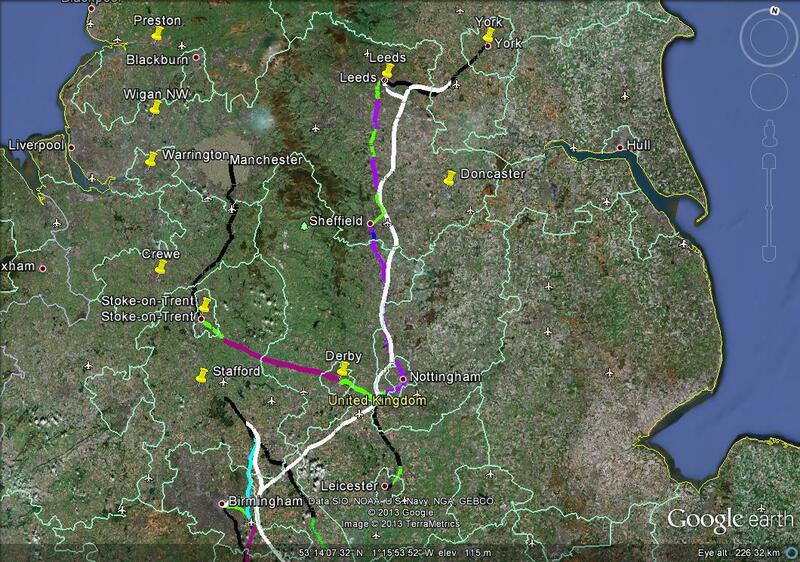 HS2 is then seen to be part of these but not separate from them so should not be treated separately. The remarks here will be limited to the four main trunk routes with HS2. HS2 is based on assumptions, such as having a dedicated separate line from terminus to terminus, which make the idea inflexible, ridiculously expensive and obviously does not consider any extensions further north. Any other considerations except the ECML and the WCML from York and Preston northwards are uneconomic, most likely not to be built, unworkable and, therefore, unacceptable. The solutions to that I have given in the previous post. "Major delays after overhead wires collapse"
"Second overhead line failure strands hundreds"
............... and these two lines are major interconnected ones. Can you imagine the troubles caused on HS2 with no alternative routes to use? This would be an invaluable promotion for airline use. The idea of fast lines must be, out of necessity, four tracks per corridor - two for intercity and two for regional traffic. They do not have to be running together for the whole length but must be connected for the reasons stated previously. That way they can be run separately but do not carve up the countryside as much as a completely new line. I have said before and repeat that the station at Euston means unnecessary tunnelling and housing destruction in London - running the line into Paddington is quite sufficient. The placing of an out of town Parkway station nowhere near anywhere anybody wants to go has no justification. Connectivety is the key - this means using the airport station at Birmingham (it is meant to be a through station anyway). Also what should be mentioned is that all the trains to Birmingham need not necessarily terminate there - the command document admits this. Some will continue elsewhere to Woverhampton or Shrewsbury or some other place - therefore, they will need to go through a through station such as New Street. Is Curzon Street so necessary? Phase Two: The extension to Manchester is a totally, superfluous, elephantine, expensive project dreamed up by consultants imprisoned by their narrow/constricting briefs and a scandalous destruction of countryside just where the options of entry to Manchester are multiple and so flexible. They are easily expanded without destroying so much green land. The extension to East Midlands is a totally different question. It is quite a necessary addition to the national network. This is especially true when you consider a Southwest Northeast axis from Bristol to the North east. Is it so necessary now? I doubt it. Of much more importance is the upgrade of the MML to the East Midlands airport. Add to this the extensions to Derby, Stoke and Manchester and then you are providing real alternatives(and competition) to the WCML. It is astounding that the planners hide behind such phrases as " the level of demand for rail travel from the region (South Yorkshire) would not make it one of the larger markets for HS2.." "...serving South Yorkshire alone would support only an infrequent service. "(p.50) All this, and more, is said, without any support, to justify an out-of-town station near Sheffield while conveniently forgetting that at present to move south it is much quicker and more convenient to use the car on the M1 next door than take the train. Many passengers in the region already have decided to use the ECML services from Doncaster. The electrification of the MML (before more upgrading) will give a much better idea of passenger demand. These are just examples but the command document is full of self justifying arguments, apparently based on whims more than facts. It seems that this project has reached a stage of being an unstoppable bulldozer of interests more than a really interesting project for the greater number and the greater good. It is time for a rethink, preferably with other consultants, under more moderate criteria. b) the electrification and upgrade of the route East Midlands - Derby - Stoke (to connect into Manchester) This would mean 41kms. of new construction with 26.3kms. of upgraded line. These are much more realistic figures to achieve better results.